Garden week is continuing here on 129 acres. 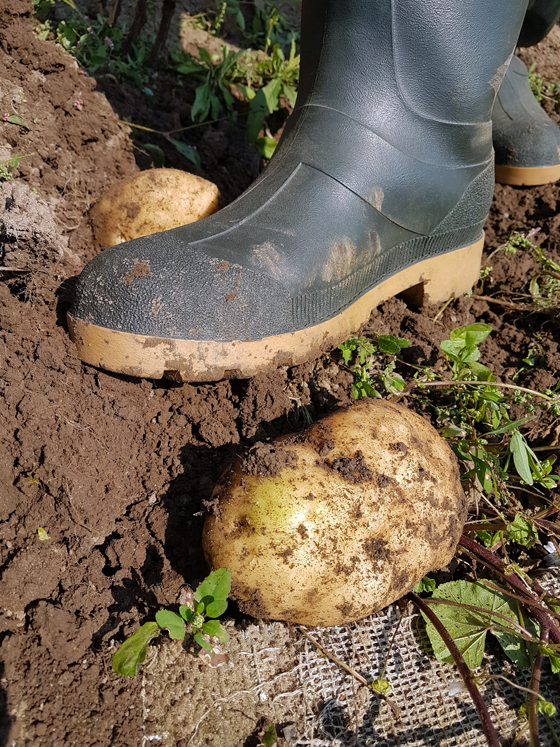 This post is all about the high point of the whole gardening season so far–the potato harvest. You may recall that we decided to devote a whole quadrant of our 2,500 square foot garden to potatoes this year. We had a whole bunch of seed potatoes–all from our own pantry–and I ended up putting in about eight rows. The results were pretty much as expected. A whoooooole lotta potatoes. 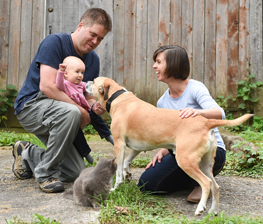 We grew four varieties: Kennebec, Russian Blue, Basin Gold and red. The Kennebecs are by far our favourite. They fry up nice and crisp for hashbrowns, but stay soft and potatoey inside. Their flavour is also wonderful. It’s a good thing we like them because we had so many we ended up picking them into the wheelbarrow. The Kennebecs also grew big. One potato will make more than enough hashbrowns for breakfast for both of us. For comparison, Matt wears a size 13 boot. The Russian Blues are fun purple potatoes. We got a decent crop of them. The reds are the first potatoes we ever tried growing. I think some of the plants were choked by weeds this year because the number of reds that we got this year was not great. However, the greatest disappointment ended up being the Basin Golds. These were an experiment. 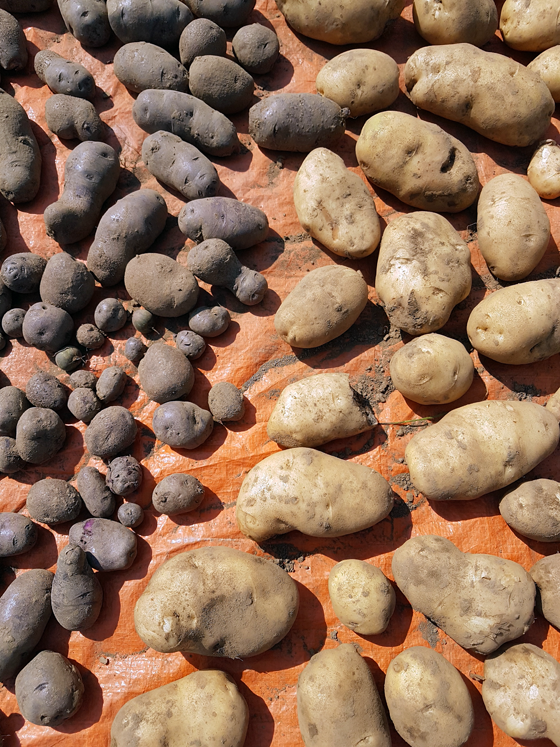 When Matt is looking for giant baking potatoes to go with our steak dinners, he picks up Basin Golds. We had a couple of potatoes that sprouted by the time spring arrived, so we stuck them in the garden. They definitely did not live up to our expectations of giant baking potatoes. First, we only got six potatoes. And second they’re small. 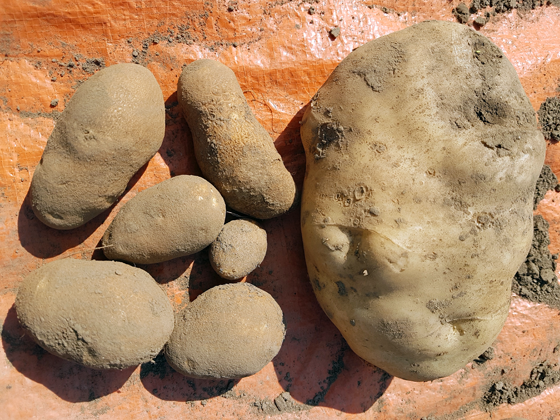 Here are our measly six taters with their size 13 Kennebec relative. The potatoes are all different shapes and sizes. There was a Russian Blue that Matt enjoyed particularly. Ahem. 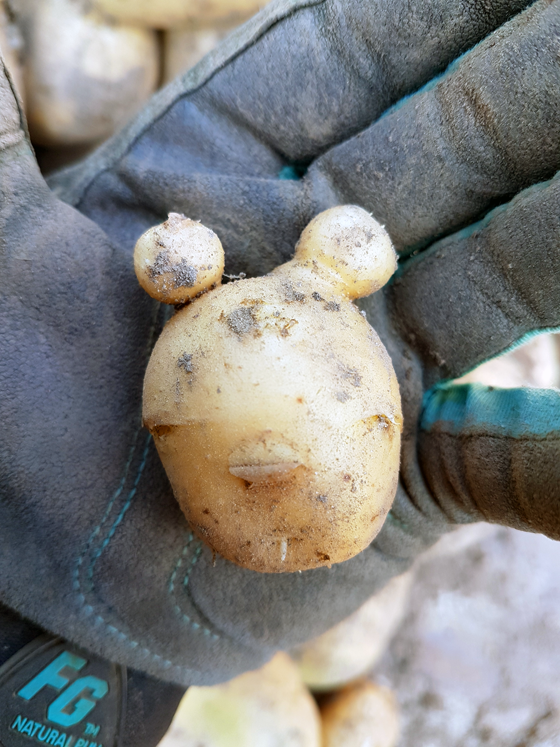 And the much more G-rated Mini Mouse potato. 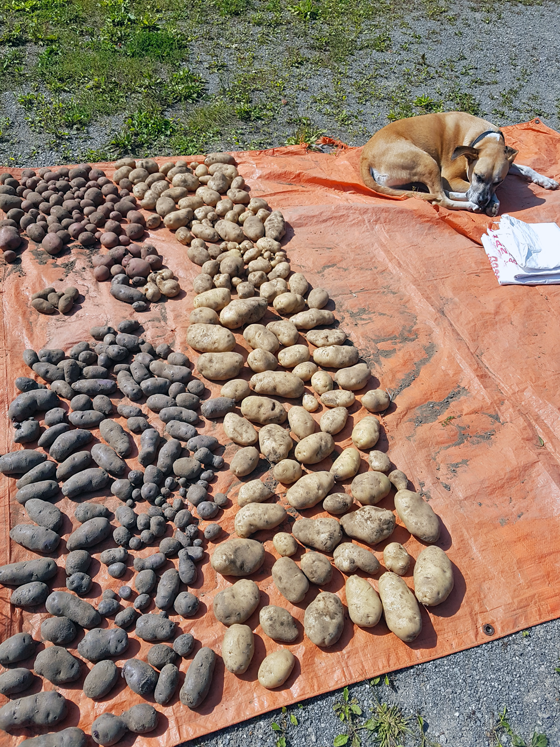 We dried the potatoes for a little while on a tarp on the driveway–supervised by that omnipresent puppy–and then loaded them into sacks and put them in the cold cellar. Last year, we followed a pretty similar process, except we put them in cardboard boxes, and they lasted fairly well. 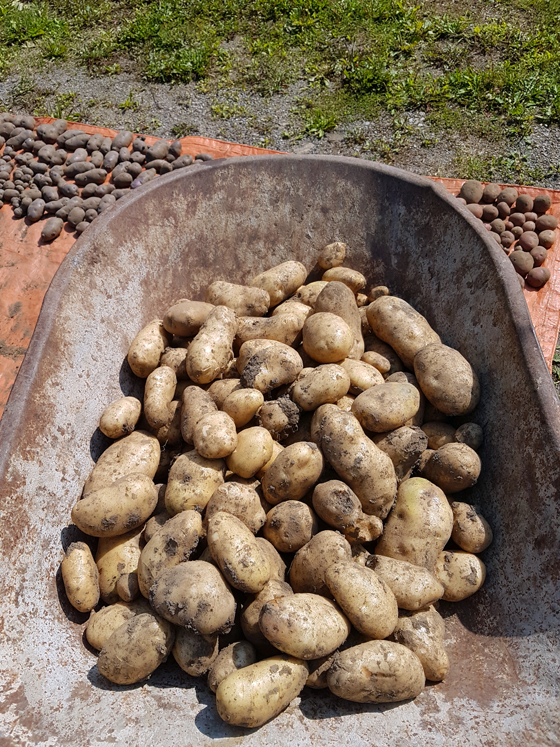 Hopefully we will be enjoying homegrown potatoes for many months to come. I’m expecting breakfast for dinner–complete with hashbrowns–will be on the menu one evening this week. 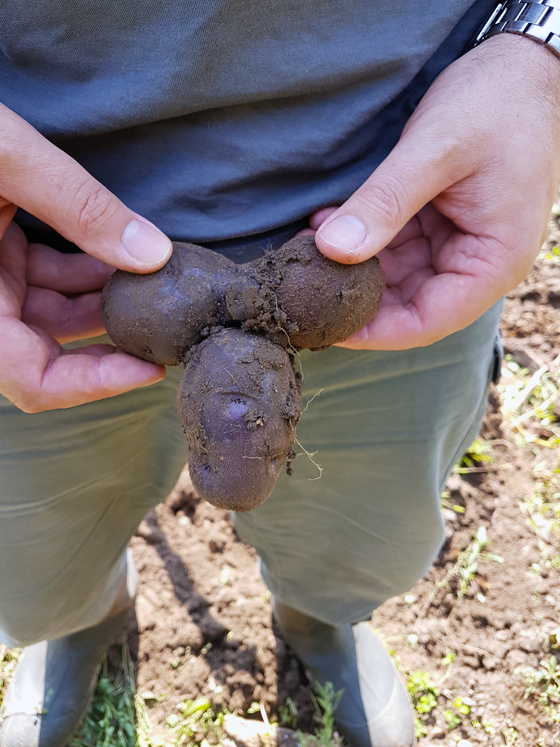 Do you grow your own potatoes? Do you have a favourite kind of potato? How do you like to eat potatoes? Any tips on storing potatoes? I’m really hoping that our sacks work well. That’s a lot of french fries right there! I cannot believe how big that potato is compared with Matt’s boot. Wow! Man, we had just the opposite luck with our potatoes. Our tops were nice and green and full but there was very little underground. Next year I would like to broaden the varieties that I plant. That’s so disappointing! Maybe one of the lessons of our Basin Gold failure is the benefit of diversifying. When one variety doesn’t do as well, others may pick up. I laughed at Matt’s reaction too. With boys it never gets old, lol. What a great crop! Do you notice any difference in taste from store bought? Like with tomatoes or strawberries, I always find the home grown ones more flavourful. I don’t know if I’ve ever had a homegrown potato. I’ve always wanted to try growing them, though. I do notice a difference from store bought. I know potatoes aren’t considered the most flavourful vegetable, but I definitely notice a difference. I love reds but my husband favours Netted Gems or commonly called baking potatoes. The reds start early and we usually eat those 20 hills fresh in the summer. The Netted Gems do everything well and they last. We store ours in sacs in a cold storage room and then use the sprouted ones for seed in the spring. We’ve had some stellar years but this was not one as it was very very dry here and pretty darn hot. 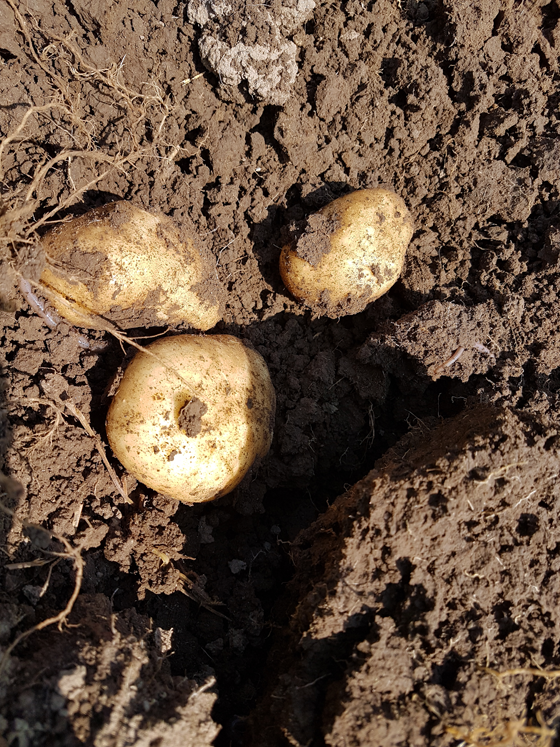 We tried Yukon Golds and were not really impressed but was it the weather or the potato. What type of sacks do you use? We unfortunately have already lost a number of our Kennebecs (our favourites). I think that our sack was too full and didn’t allow for enough air circulation. 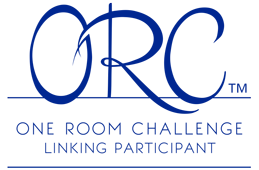 We use burlap sacks — the key I think is the cold room. Do you have somewhere cold? We have a cold room under a former front porch (all concrete). I was wondering about the sacks because we reused some birdseed sacks I had saved, which are more plasticky than burlap.